Vegan Heritage Press, LLC, 9781941252093, 256pp. The recipes have been designed to simplify complex vegan cooking procedures, and Richa’s workflow tips incorporate modern appliances and techniques from other cuisines to reduce cooking times. Replacement spices are indicated wherever possible, and Richa also provides alternatives and variations that allow people to be playful and creative with the Indian spices called for in the recipes. Richa Hingle grew up in India, where everyday food was vegetarian, with a focus on legumes, grains, nuts, and vegetables. Eating fresh, local, wholesome foods was a way of life. Today, she is the prolific and award-winning recipe developer, blogger, and photographer behind the very popular VeganRicha.com. She has a large community of followers who love making her recipes and sharing them with friends. 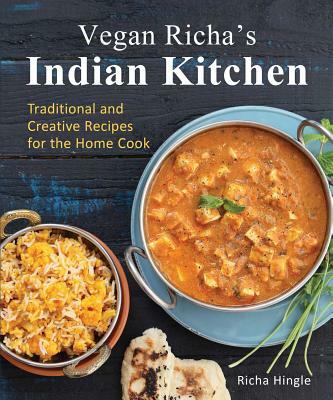 Richa’s instructions are easy to follow and her step-by-step photographs encourage anyone to learn how to make great Indian food. Her eBook Indian Vegan Diwali Sweets was wildly successful because of her ability to create vegan versions of Indian deserts that were previously deemed too difficult. Richa lives, writes, and cooks in Seattle, Washington.